How Do Binaural Beats Work? The first question on everyone's mind when they discover this special music is how do binaural beats work? Well, this isn't a new-age fad: it's a naturally occurring science that has been around for centuries. What most people don't realize is that although the creation of binaural beats music has only been possible through technological advancement in the last 100 or so years, the use of this natural science dates back thousands of years. Ancient cultures were aware of how the brain could be entrained through sound repetition well before modern science was able to prove the process. 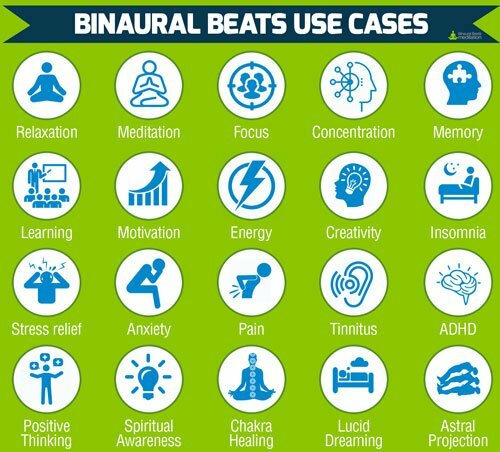 Now of course, in times past, societies didn't refer to this science as binaural beats, but what they did know was that consistent, rhythmic sound had extremely powerful healing and spiritual benefits. Scientist Melinda Maxfield, PhD, conducted research on the drumbeats used during rituals of ancient cultures and found that they generally beat at a steady rate of 4.5 beats per second. This consistent beat induces a trance-like state for the tribe, due to the brain shifting into a 4.5 beats-per-second brainwave frequency, which is a low Theta brainwave state, as you'll learn about below. Indeed, in almost every ancient culture, repetitive beat formats have played an important role in wellbeing and prosperity. For example: through the use of repetitive drumming and chanting, Tibetan monks, Native American shamans, Hindu healers and master Yogis have been able to induce specific brainwave states for transcending consciousness, healing, concentration and spiritual growth. Andrew Newberg, neuroscientist at the University of Pennsylvania, and author of “How God Changes Your Brain”, discovered that while we are deep in prayer or meditation, activity in our parietal lobes drops to almost nothing. The parietal lobe is responsible for sensory awareness and orients us in the world. Newberg believes that the drop in activity during meditation and prayer explains that sense of oneness we feel with the universe when engaged in these focused activities. The way binaural beats work was first discovered in 1839 by a Prussian physicist and meteorologist named Heinrich Wilhelm Dove. 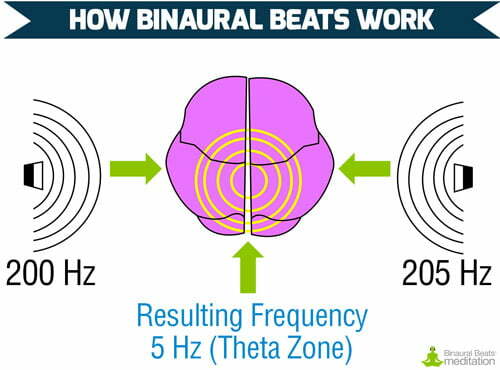 It is possible that hormonally induced physiological behavior changes may be made apparent by measuring the binaural-beat spectrum. Forty five years on, and a heap of research by scientists and sound engineers later, the science of binaural beats (brainwave entrainment) is used by people all over the world to entrain the brain into different states that contribute to stress relief, focus, aiding sleep, pain relief and much more. The word binaural means “having or relating to two ears”. This represents the process, which works by simultaneously sending a marginally different sound frequency to each ear through headphones. Brainwave entrainment happens inside the brain, and is caused by a physiological response. Upon hearing two tones of different frequencies – sent simultaneously to the left and right ears – the brain perceives a third tone based on the mathematical difference between the two frequencies. The brain then follows along at the new frequency and produces brainwaves at the same rate of Hertz (Hz). For example: if a 200 Hz sound frequency is sent to the left ear, and a 205 Hz to the right ear, the brain will process those two frequencies and perceive a new frequency at 5 Hz. The brain then follows along at the new frequency (5 Hz), producing brainwaves at the same rate of Hertz (Hz). The technical term for this process is ‘frequency following response'. Remember, the brain will only respond in the intended way if it receives the sound frequencies at the same time through headphones. You can test this for yourself using the test tone further down the page. All you have to do is put on a pair on headphones, relax and press play. It's that easy. Our music is created by professional sound engineers with over 17 years experience in creating brain entrainment products. We do not use hypnosis or subliminal messaging; only the proven science of binaural beats, combined with musical compositions tuned to enhance the desired state. As explained above, binaural beats can entrain the brain to different states, of which there are five key categories (shown below). The effect on the listener is dependent on the brainwave state the music is targeting. For example: To induce deep relaxation we can listen to Theta state music, like the music in this section of our store. For entraining the brain to sleep deeper, we can listen to Delta state music. See the Delta music we have in store by clicking here. At BinauralBeatsMeditation.com, we test our music on a broad demographic of people prior to commercial release. This allows us to produce music that is proven to work and fit for purpose. The benefits listed under each brainwave state are general associations and it should not be assumed that all frequencies within the state’s range will produce these benefits. 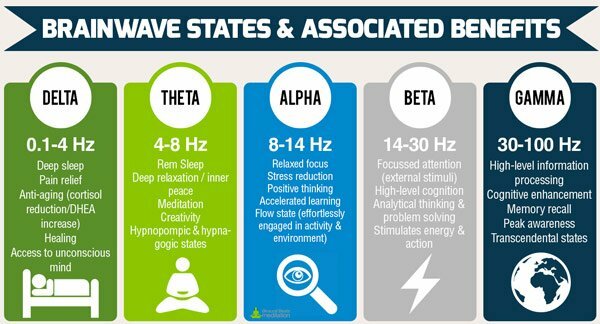 There are specific frequencies associated with specific states, and indeed different results will be experienced in the high, middle, and low areas of each brainwave state. Test the Science for Yourself! After reading this information, you probably ‘kind of get it'. But to fully understand how binaural beats work, you need to hear the effects in real time. Below is a sample of a raw (naked, with no music overlay) Theta binaural beat set to 6 Hz. Put your headphones on and press play on the player. When you have both earphones in your ears, note that you hear a single pulsating sound. Some liken it more to a wavering or trembling type sound. Now, remove one earphone – left or right, it doesn't matter. When you remove one earphone, you will notice that the pulsation disappears completely and that you hear a single tone in the earphone you still have on. When you put the other headphone back in your ear, the pulsating sound comes again. This is because when you have both earphones in, your brain is perceiving a third tone from its mathematical interpretation of the left and right tones (a binaural beat). In this case, that interpretation is 6 Hertz. Your brain follows along at this frequency. This is the ‘frequency following response' process I discussed earlier. And there you go! You have just entrained your brain using a binaural beat(s)! Of course, you'll have to listen for at least a few minutes to start feeling the effects. Why is it Called “Binaural Beats Meditation”? ‘Binaural beats meditation’ has become a common term for listening to binaural beats music. 1. In a similar way to meditation, a lot of binaural beats music is designed to entrain the brain in a similar way to that of meditation, which is referred to as mindful awareness, or entirely in the present moment. 2. Generally speaking, binaural beats music is accompanied by ambient, relaxing music, which is usually quite similar to the sound design used in meditation music. 3. As in meditation practice, when listening to binaural beats, some people choose to sit in the traditional lotus meditation position because it is conducive to attaining a relaxed, centered state of mind. This state is also conducive to entraining the mind. That's it! We hope you now better understand how binaural beats work. 20% off all downloads! Discount is added in the cart. BinauralBeatsMeditation.com © 2011-2019. A division of Mindful Media.